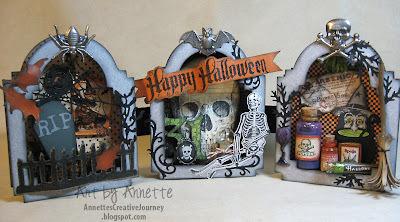 This month for my All Things Tim club, we will be getting into the Halloween spirit and making this tombstone trio display. 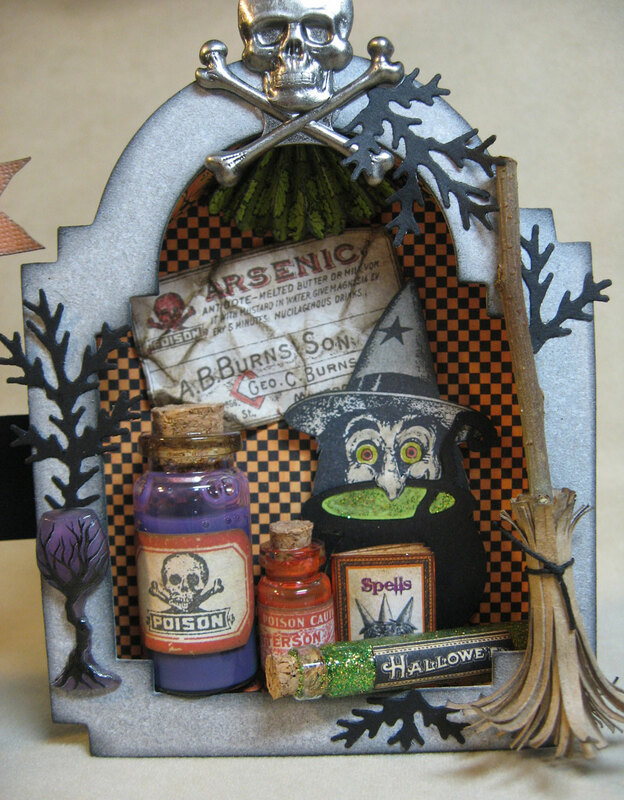 Each tombstone is created using Tim Holtz's Sizzix Alterations Dies: Cabinet Card and Mini Cabinet Card. I created a framed display piece from each tombstone to fill with Idea-ology items like fragments, Halloween muse tokens, and more... as you'll see. I also used the fabulous Graphic 45 Happy Hauntings papers, along with Tim's Kraft Kore card stock, and several more Sizzix Alterations dies. 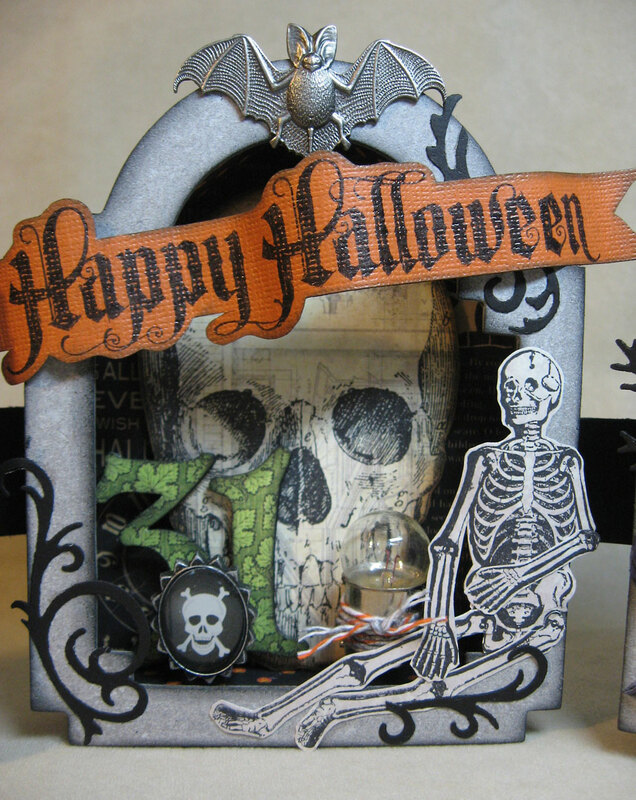 I simply ADORE the Stamper's Anonymous Apothecary CMS138 stamp set which contains the large skull and the Happy Halloween images you see here. The seated skeleton is from Mini Halloween2 CMS113, and all those flourishes on the border are from the Sizzix strip die called Festive Greenery. Tucked inside is one of Tim's Idea-ology bulbs wrapped in twine and the big 31 is cut from the Gothic Boo Sizzix Alterations die. The skull charm is a Jolee's embellishment. 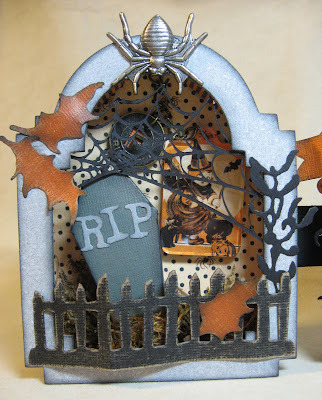 Did you notice the Halloween Adornments at the top of each tombstone? I just love those things. Can't get enough of them. I fashioned a home-made broom from a twig in my yard and some Kraft card stock snipped with my Martha Stewart fringe scissors. 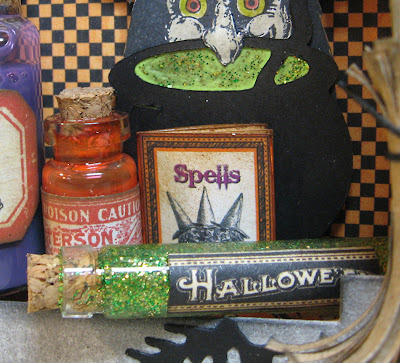 Corked vials filled with mysterious potions surround the green-eyed witch keeping watch on her bubbling cauldron. Tucked in between vials is the Spells book which I created by hand using digi-images I purchased from 2Peas. I typeset the word Spells, imported the three witches and the border, then built a tiny book and pasted the cover to it. To give the Spells book a little more realism and dimension, I put a few pieces of black foam squares between the pages. Thanks for stopping by today and checking things out. I had a great time creating this piece and hope you enjoyed it too. I can't wait until my class this Friday! Wow! Wow! I love your Halloween trio!! That is so totaly awesome. Nice work. How did you make the window box effect? Can you maybe show a photo from the side. Thanks so much. Just fantastic! You did such a great job with the Tombstone Trio. Love these! I haven't invested in any of the SA seasonal sets but have been thinking about the new Hallowe'en ones. I have the cabinet die but not the mini - now you've got my imagination going. Thanks! WOW!!! I love this! You did an awesome job!! This is sooo cool! I love projects that draw you in and make you look for all the little details. How awesome! These are so cool and very cute! I like seeing playful Halloween things. Great job! These are so cute and clever!! Love them. Just spectacular! All the detail.. it's so cool! that is so cool!! I think I need the mini cabinet card die too, lol. I love how you used them to make the frames for the scenes. These are incredible, Annette!! 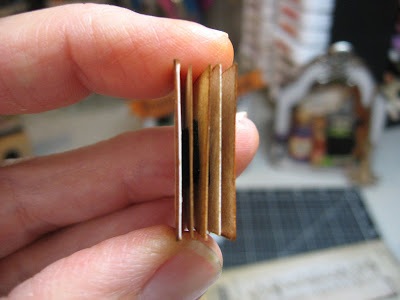 You should post a link on the Sizzix blog I Spy post! Awesome trio. Such fantastic details and imagination! Wish I was part of your club!! What fun! So many tiny treasures to find. Wow, Annette, that is fantastic! Love all your wonderful components... that 31 is my fave I think, though so hard to choose! What die did you use for the fence? This is beyond stunning !! Wow !Amazing !All the details ?? Awesome ! !Can't say enough lol !